Is the luck of the Irish really a thing? I’m not too sure but I do know that four leaf clovers are super cute and look great for wearing my obligatory green during St. Patrick’s Day. Today I have designed 7 variations of the four leaf clover for you to enjoy 100% FREE of charge. As a reminder you are more than welcome to use these designs for personal or commercial use but only up to 200 uses and only on things that you are making in your own home. But please don’t put them up on a print on demand shop like Amazon merch or Printful. These designs and digital images are not to be re-sold or recreated or shared somewhere outside of this post. So please make sure to let a friend know that here is where they can find some adorable free four leaf clovers. If you have questions please feel free to reach out. I am happy to help clarify! Love the simple classic SVG style? We also have some adorable hearts available, so if you haven’t downloaded those freebies yet make sure to head over here and do so. Designs that are easy to use but really add a nice seasonal touch are some of my favorites! THERE ARE AFFILIATE LINKS IN THE POST WHICH MEANS WHEN YOU SHOP THROUGH OUR LINK AT NO EXTRA COST TO YOU WE EARN A SMALL PERCENTAGE OF THE SALE. Now. 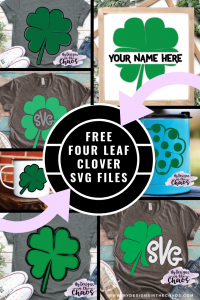 let’s dive into the four leaf clover freebies for St. Patrick’s Day! This circle monogram looks great on a corner pocket or even the back of a shirt. You can make it large or small and it will still look great! When I use this mock up I always get tons of questions on the cup and where to find one. You can purchase your own just like the picture here. We share all of our favorite blanks here and explain exactly what a blank is here. Maybe you are just curious as to what a mock up is and how you can use them in your business? Check out this post. We give you all the insider scoop! This design might be a little bit tricky to weed but the end result is totally worth it. Check out our favorite weeding tips over here on this post. You can also always print this design or try out sublimation too! Either of those would work great. This one is a super cute way to personalize an item for the holiday. I can see it on a sign (learn how to make one like picture below here) or a mug. This mug is one of my favorites! I love this style of monogram topper because you can make it small or big and it can fit both a girl or a boy’s style. I absolutely love this monogram font as well. You can get a copy for yourself here. It goes with everything and is so fun and whimsical. Perfect for the St. Patrick’s Day holiday. While this color combo is a little bit unconventional I thought the funkiness of it was really appealing. I can even see this fun free four leaf clover looking great in some pattern vinyl too. While I have heard you can use HTV on glassware I haven’t personally tried it yet. I stick to 651…. (see what I did there lol) Check out more of all the different types of vinyl and an explanation of each kind here. I included this simple version of the messy design for those of y’all who love the look but don’t love to weed. (I myself fall into this category at times…..) Especially if it is a last minute project. 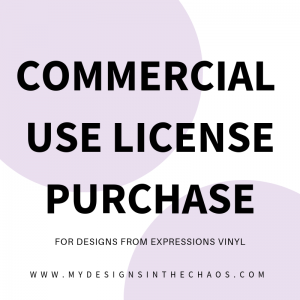 Speaking of last minute projects check out this post where I share all the vinyl I think you should have on hand just in case one of those last minute projects pops up! Easter is the next holiday and it always seems to sneak up on me! I have provided five freebies for you to get Easter ready over here on this post. We absolutely love that you are here! If you could take a moment and pin one of the images above before you download the bundle that would be a huge blessing to our business. It helps us continue to provide high quality free files for you! We have provided all the images pictured above in one single bundle for easy access. Please note that the bundle will be downloaded as a zip file and will need to be unzipped in order to access the SVG file. In the folder you will find a PNG image of each design, an SVG, an EPS, and a DXF file. If you are looking for a few more designs to get you in the green mood, check out more St. Patrick’s Day SVG designs here. Thanks for stopping by and make sure to let a friend know where they can find some ‘luck’ for themselves. 🙂 Have a wonderful St. Patrick’s Day and ’till next time happy crafting, cutting, and chaos! Hi Michelle 🙂 Each time I’ve tried to download the Four Leaf Clover Bundle, I get the message that it is unsafe to download this file and was blocked by Windows Defender SmartScreen. I’ve not had that happen with any of your other designs! Thought you should know in case there are other people experiencing the same thing. Thanks for all your generous offerings of designs. That is super weird! It sounds like you may have a security blocker or cookies blocked on your computer that isn’t allowing it to download from the site. I have tried it on my end as a user and it seems to work ok. Please feel free to reach out if it continues. Thanks so much for letting me know. I appreciate it!